Recently I took a solo trip to Italy with my daughter. 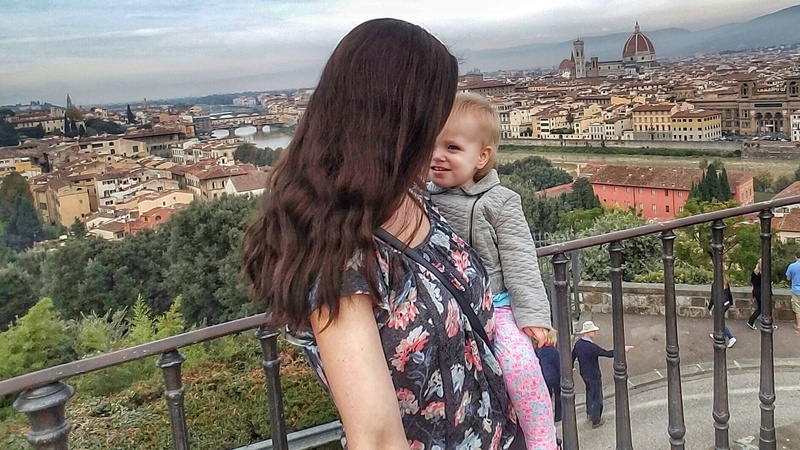 Managing a young child while traveling abroad can be daunting (especially by yourself), but I found that Italy couldn’t have been more child-friendly. So if you’re looking for a place to go with your kids, Italy should be at the top of your list. Italians adore children. I couldn’t make it halfway down the street with my daughter without being stopped and hearing “Ciao bella” or “Bellissima bambina.” Everyone wanted to talk to her and even kiss her, because apparently kissing stranger’s babies is completely acceptable in Italy. She was given special treatment everywhere we went. Each bakery or restaurant we went in, she was either given a cookie or piece of bread. We were also upgraded to bigger rooms in all our hotels to accommodate her. It is safe to say my little girl was spoiled beyond belief during our travels. Long story short, Italians make the extra effort to help families with children. If you take your kids to Italy, prepare for them to be spoiled! The food! What kids don’t want to eat pizza, pasta and gelato every day? Italy is a picky eater’s paradise. Need I say more? One thing I really enjoyed about Italy was the array of piazzas. If you aren’t familiar with a piazza, also known as a plaza, it is essentially large open area outside within the city that is blocked off to cars. Usually there is a fountain, shops and restaurants in and around the piazza. Piazzas were great resting points during the days of non-stop walking. I could let my daughter run around without worrying about her getting into trouble. We also stumbled across many garden and playgrounds, and a beautiful carousel in Florence! Italy is a beautiful country with an abundance of different environments. Mountains, beaches, big cities, and countryside: you name it, Italy has it. This gives you and your children the opportunity to have a vacation that everyone will enjoy. Spend your travels exploring the diversity of the lands to get a real feel for the country. Tip: Visit a smaller town with a less hectic itinerary in between big city destinations. This will give everyone a break from the hustle and bustle of constant sightseeing, and ensure no one gets worn out. I absolutely loved the Cinque Terre region for our getaway between big cities.